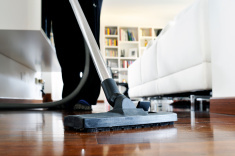 Vacuum or sweep your floor regularly to remove dirt, dust, and any loose material. Remove spills promptly. Use a clean, soft cloth to clean up wet spills. Use a vacuum or broom to pick up dry spills and abrasives. Place mats at exterior doors to trap sand and grit from incoming traffic. Install felt floor protectors on the “feet” of all furniture. Use area rugs on high traffic areas. All rugs should allow your wood floor to breathe. Avoid rubber-backed rugs. Maintain the relative humidity in your home between 45% and 55%. Excessive humidity or extreme dryness can cause your wood floor to swell or shrink, creating cupping or cracks. Do not let sand, dirt, and grit build up. They can act like sandpaper and actually abrade and dull your floor finish. Never wet mop or use a combination of water and vinegar to clean the floor. Excessive amounts of water can cause your floor to swell and cup and will dull your floor and finish over time. Avoid walking on wood floors with high heel shoes. They can severely damage wood floors. Keep pets’ claws properly trimmed to avoid excessive scratches. Do not use wax, oil soap, liquid polish, or other household cleaners on your polyurethane finished wood floor. The use of these products can dull today’s floor finishes and make refinishing difficult. Not sure which hardwood floor option is right for you? Let us help guide you through the process. Simply contact Century Wood Floors today at 773-506-2507.